The Outstanding Professor Award recognizes a faculty member for overall excellence in academic assignment. This year’s winner comes from the College of Social Sciences. He will be honored at the 17th Annual Faculty Service Recognition and Awards Luncheon on March 15, 2016. Tickets are available for purchase. Kenneth Peter has a knack for making connections—from teaching cross-disciplinary courses to personally ensuring the success of students in the Humanities Honors Program or in his political theory courses. Peter’s ability to foster meaningful relationships with his students leads them back to him when they need a reference for a scholarship or an application for graduate school. During his 25 years of teaching political theory courses in the College of Social Sciences, he has penned hundreds of letters of recommendation. For the last nine years, Peter has split his time between his home Department of Political Science and the College of Humanities and the Arts’ Humanities Honors Program. He says the interdisciplinary program is exemplary at helping students form meaningful connections with their faculty members and peers as part of a two-year cohort. 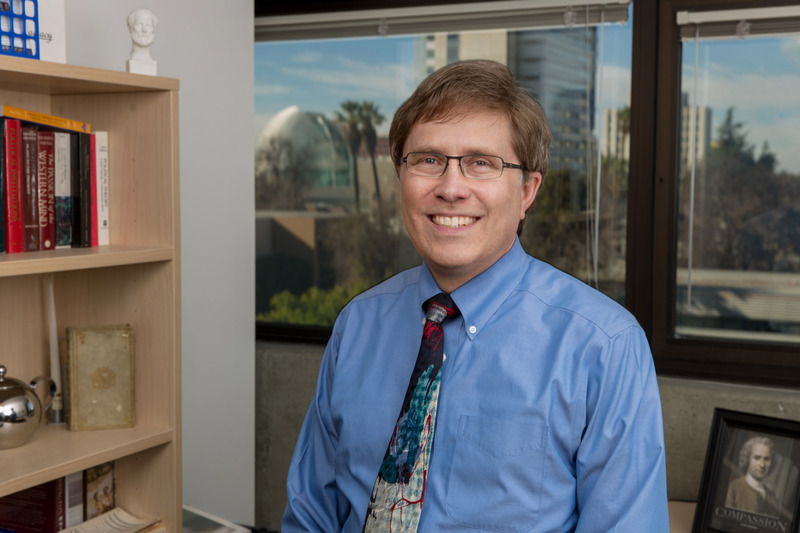 He received the SJSU Distinguished Service Award in 2000 and has been recognized by students in his department with the Outstanding Professor Award multiple times. Peter has served as a member of the Academic Senate. As chair of the Political Science department’s Scholarship and Development committee he has helped to create two endowed scholarships funded by former students in support of future scholars. Through his participation in the Humanities Honors Program, he is constantly discovering new subjects to present to his students and colleagues. When he read W.E.B. DuBois’ writings in depth in preparation for a humanities course, he started incorporating it into his American Political Thought curriculum. While he has lectured at other universities, Peter says San Jose State students bring with them unique life experiences that can broaden their understanding of some of the concepts he teaches in political theory. When teaching Karl Marx, for example, he says that many of his students have worked long hours at jobs to support their families or pay tuition, so they understand the alienation of labor. “Their learned experiences are a great asset,” he says.